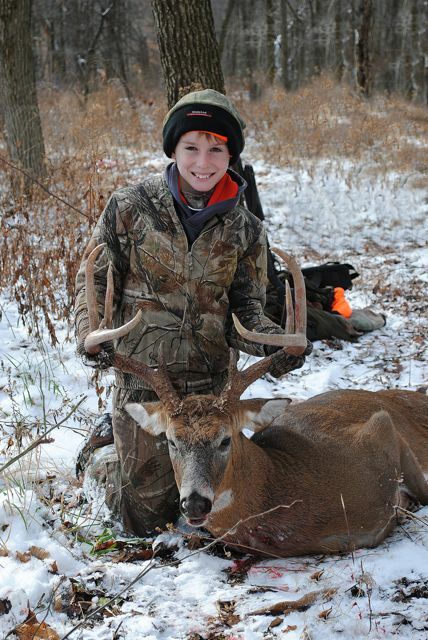 Brock’s First Buck is a Bruiser! Persistence can be a hunter’s best friend. It’s something that I often remind myself when my outdoor adventures don’t seem to be panning out quite as planned. After more than two decades of hunting whitetails, I’m also well aware that the closest cousin to persistence is frustration. 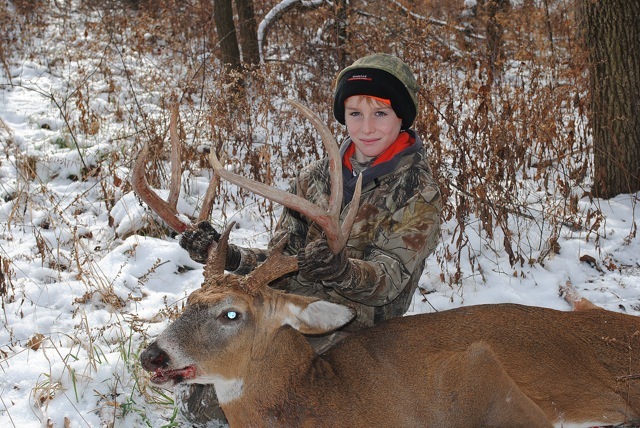 Brock holds his first buck, an Ohio giant! 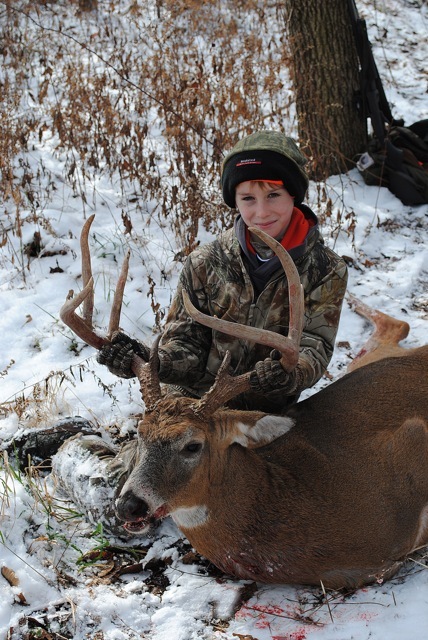 My 13-year old nephew, Brock Albaugh, epitomized persistence this fall, parlaying many hunts and a few close calls into his first buck this morning. And a dandy it is, sporting 10 points and enough headgear to make topping it quite a challenge for the rest of his hunting career. Brock earlier had been hunting another Ohio giant that he and his dad (my brother-in-law Jeff) had been seeing on a regular basis. After seeing the deer on several sits with his bow, Brock was nearly devastated to find out another hunter was able to take that buck a few weeks ago. Instead of getting frustrated, he decided to keep hunting. And instead of shooting a young buck that would make many a hunter proud, Brock stayed hell-bent on waiting for the right mature whitetail to make his way by him. Can you imagine? I’m not aware of too many young hunters that could pass several bucks that would be fine “first deer” in lieu of just the right buck! I’m proud of him for being able to do that even though I’d have been proud with whatever buck he was able to take. His hunting schedule did get a little cramped when basketball season started a couple weeks ago. Archery season turned into the general firearms season. And this morning proved to be the magical day for Brock as he and his dad entered the woods, joined by Brock’s uncle Bart. Amidst a cold, snow-blanketed morning Brock was able to line his sight on this deer not once, but twice before taking him down with a well-placed shot from his dad’s Remington muzzleloader. Another picture of the happy hunter! As Brock tells the story, he watched the deer come out into the field he was hunting near. With his dad watching nearby, Brock was able to get one shot off at the deer before he reentered the woods. A reload and a relocation later, Jeff and Bart were able to drive the deer out of a hardwoods and right in Brock’s direction again. He provided a great shot for him and Brock made it count. We have a standing agreement to text each other with any “good news” from the deer woods, so you can imagine my elation when the text came in under the heading “shot just a couple minutes ago.” That’s also when I realized that texting is great, but I couldn’t wait to hear Brock tell (and hopefully relive) the story of how it all went down. He did a fine job of doing that as well. This entry was posted on Sunday, December 5th, 2010 at 10:32 pm	and tagged with Deer Hunting, First buck, Ohio bucks, Whitetail and posted in 2010, Day Afield. You can follow any responses to this entry through the RSS 2.0 feed. Its a nice blog for Hunter.